Lentil Breakdown: Kale Wars? Dumpster Diving? Must-See Food TV! This article originally appeared on the food site Zester Daily. 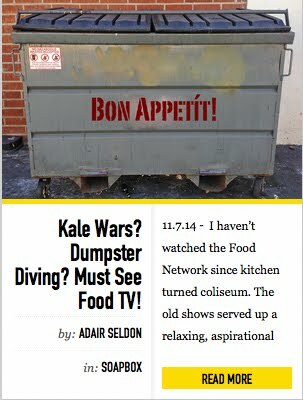 I haven’t watched the Food Network since kitchen turned coliseum. The old shows served up a relaxing, aspirational escape, but once they got all Cutthroat, I cut the cord. Instead of relaxing and aspiring, I was stressing and perspiring. Sheesh. If I wanted that kind of anxiety, I’d cook dinner myself. With guys full of tats and swagger and show themes like Superstar Sabotage, the Food Network has perfected its junk-food formula to a T. Must-see-testosterone-TV. According to The Atlantic, the five most-watched primetime shows on Food Network this year are competitions: Food Network Star, Worst Cooks in America, Chopped Tournament, Cutthroat Kitchenand Guy’s Grocery Games. According to Nielsen, the 20 most-viewed primetime shows on the Food Network pulled in a median of roughly 1.1 million viewers per episode in 2014, compared to 255,000 viewers per episode in 2000. Sure, the Food Network has its salt-sugar-fat formula down, but what if it could provide content that both entertained and nourished—edgy and educational—while keeping the ratings intact? Who says suspense, conflict, humiliation and ring-molded entrées with Jackson Pollock-inspired plating can’t have a higher calling? So before the Food Network goes from offal to worse, I propose it start feeding viewers something more nutritious. Here are three ideas for more filling, yet thrilling Food Network shows. Former Congressman Dennis Kucinich mentors six “food fighters.” They each have a cause they fight for, whether it’s stopping a retail grocery chain from carrying meat with antibiotics, getting a processed-food company to stop using GMO ingredients, getting a fast-food company to stop sourcing pork from pigs raised in gestation crates or getting a school district to stop sellingsoda in vending machines. Each week the food fighters have an assignment, from crafting a strategy and creating a campaign to getting media attention and planning a rally. At the end of each show, one food fighter is eliminated. The three judges are Woody Harrelson, Michael Pollan and activist blogger Vani Hari, aka Food Babe. There will be additional commentary by experts in the field. The final two fighters meet with corporate execs from two companies that represent the opposition. The winner is judged on both the effectiveness of the meeting and the campaign as a whole. The prize is the winner’s choice of seed money to start a nonprofit or a year’s salary to work for an existing nonprofit. The feisty Kucinich gives planetary do-gooders a tough-love education in food politics. Think Donald Trump with a bigger brain and smaller comb. And live wire Woody Harrelson as a judge? ‘Nuf said. Viewers will be inspired to work toward a food system that is healthier for people and the planet, while learning how politics influences our food supply. Jeremy Seifert, filmmaker and star of the film Dive!, hosts two teams of “divers” who hunt for food in dumpsters behind grocery stores. 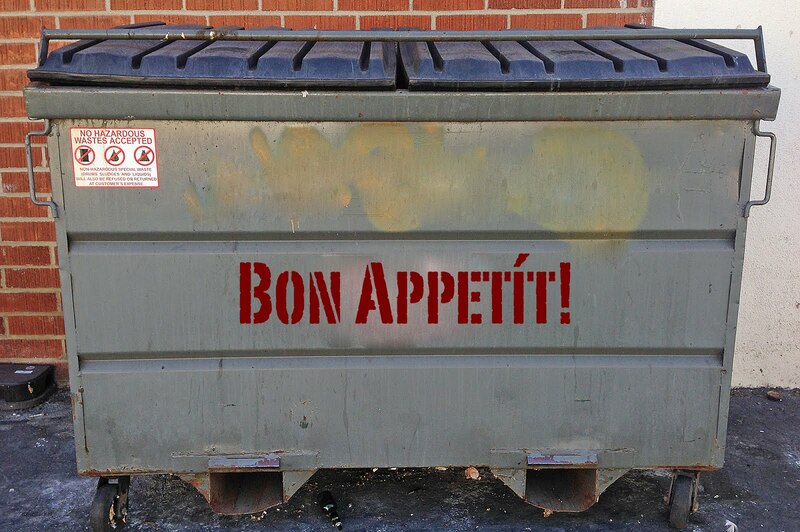 We witness vast amounts of wasted food as they forage through garbage and collect their unspoiled spoils. Each week, two teams (two divers per team) collect edible food from grocery store dumpsters in shopping carts (a la Guy’s Grocery Games). The second half of the show takes place in a studio kitchen equipped with showers, where the teams emerge squeaky clean and reveal their bounty. They are allowed certain swaps so that it’s even among both teams, and we watch them prepare a meal in a set time. Upon dramatic, heart-thumping music, the “taster” emerges to test each dish to ensure the food is not spoiled before three celebrity chef judges try the dishes. Each week one team is eliminated. There will also be commentary by food waste experts and a lawyer. The winners from previous shows return and are assigned to two final teams. They must dive at two locations—a grocery store and a bakery—and the meal must include dessert. Stealthily dressed characters in protective gear and flashlights enter gross-out zones so vivid, we can smell it. And celebrity chefs eating trash? Bon appétit! The audience will learn eye-opening statistics about food waste in this country that will awaken and empower them to reduce waste. Four chefs park their kale carts next to anonymous fast-food chains in inner city food deserts. Each chef hands out samples of a kale dish he/she has made to introduce the fast-food eaters to a healthy alternative with the goal of starting a movement that demands more grocery stores and fresh produce be brought to the area. Each week takes place in a different food-desert city, from New Orleans and Memphis to Detroit and Chicago. The chefs must get passersby to taste their dishes and to join the “kale revolution.” The recruits sign a petition and agree to write letters, make phone calls to local government officials, go to city council meetings, etc. With chefs strategically staked out in different regions throughout the series, the revolution will spread as cities compete against each other. Each week, the four kale revolution chefs are judged by two chefs and one politician on their kale dishes, as well as the number and quality of recruits they sign up. The winner of each show donates money to a local food bank. The winning chefs from previous shows and cities all compete for the grand prize money that the winner will donate to a nonprofit related to food deserts. Kale pushers on inner city streets gettin’ all up-in-your-face with burger-hungry folks? Hot dog! The audience will learn about the millions of people in America who live without access to healthy food options, resulting in high levels of obesity, diabetes and cardiovascular diseases. Food Network execs: Have your people call my people. I’m giving you first dibbs before I shop these gems around.